Once again I’m late to the pizza party, but thankfully this doesn’t include animitronics and cardboard with tomato sauce from Chuck E. Cheese. First it was Antico, but I was only 7 or so months late to that party. Truth be told, I didn’t care about my tardiness as the diavola pizza from Antico has quickly become one of my absolute favorites in the Atlanta area. Now, I’ve finally gotten around to trying Varasano’s Pizzeria, only a year and half after Blissful Glutton and Foodie Buddha. At the very least, I’m pretty sure in the months since March 2009, Varasano’s has had the time to work out any new restaurant kinks. While ambiance plays a large role in anyone’s perception of a restaurant, I try not to let it bother me that much. That being said, it’s remarkable just how different the surroundings of Varasano’s are to that of Antico. 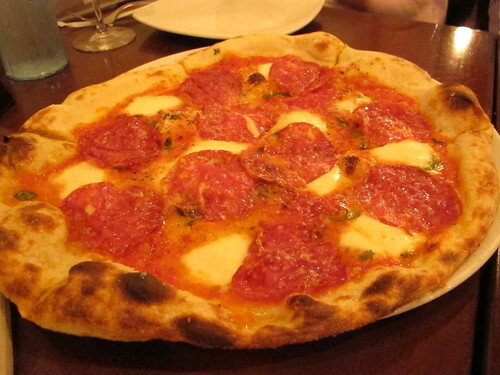 Granted, Antico did start out as a take-out only pizza joint, but there’s a bit more flash to Varasano’s. I suppose it’s perfectly in line with its Peachtree surroundings. 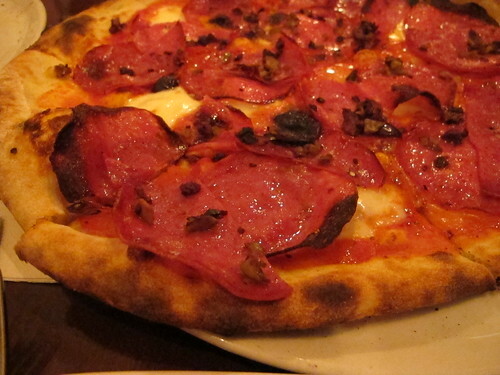 Looking through the menu at Varasano’s, it’s hard to resist the temptation of a salumi plate, but I was there for pizza! Actually, why not just combine them? Starting with a Nana pizza, (the house specialty) a mozzarella and tomato sauce topped pizza, we added some extra hot sopressata for good measure. It’s nice to see a pizza place that doesn’t skimp on the cured meat. I loved the slightly charred crust on this pizza. There’s a simple, bright flavor to the sauce on the Nana pizza and with the addition of some pork in the form of sopressata, it was pretty damn good. Of course, I couldn’t leave well enough alone. 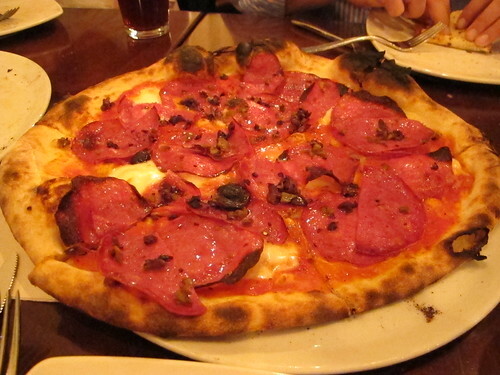 The three of us, Aaron, Jennifer, and myself, needed a second pizza and that came in the form of the Salumi pizza. With tomato sauce, cured meats, and spiced olives, it might have been overkill in the meat department, but who cares? There was more of that beautiful bubbly crusty and of course a lot of cured meat. One thing that did surprise me was the olives. I was expecting the typical olive flavors but was greeted by an actual spiciness. I suppose I shouldn’t have written off the “spiced olives” as fluff. They really helped round out the pizza and make it an excellent choice. Even though I might have overdone it with the meats, I still thoroughly enjoyed the pizza from Varasano’s Pizzeria. They did everything well; from the crust to the sauce to the generous hand with the cured goods, it was all quite tasty. That being said, I still found it lacking in comparison to the pizza from Antico. 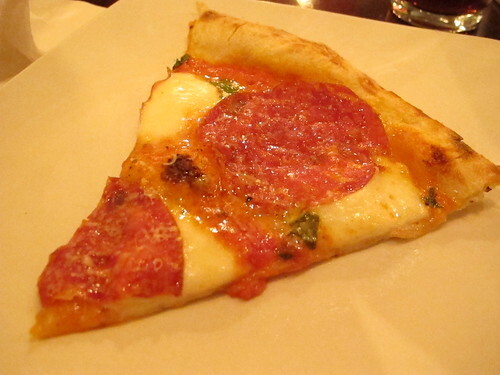 Despite being a quality pizza, it was missing a certain richness, an intangible aspect. 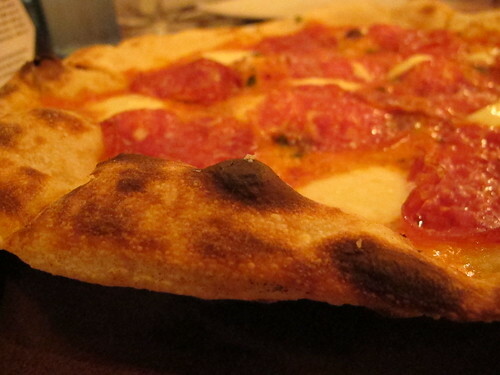 Still, Varasano’s is an excellent place to get a pizza; it’s just my second choice to Antico.